Pontiac had developed the 303 for the TA series. What happened that they canned it and Pontiac was allow to run with the Chevy 302 instead? I'm going to see if Bruce (Bruce302) will answer this for you. He's extremely well versed on the subject. His race car started life as a '68 Camaro but was converted by Jerry Titus and T/G Racing into a Firebird. It has a lot of very unique and special pieces on it. There were several "Firebirds" in Trans-Am that started life as Camaros. I'll let him know about your post. I'm not an expert but from what I read the SCCA required 1000 factory built cars available to the public to be legal to race. 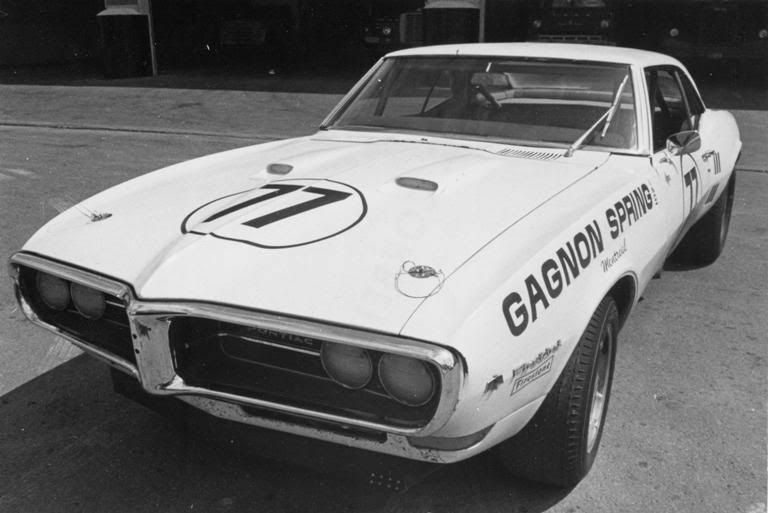 The 67 Z was only 602 built but the SCCA allowed them to include the SS 350 Camaro to make up the 1000 min. The SCCA allowed the 302 Chevy in the Firebird because the Chevy engine was used in some Pontiacs in Canada. In 1970 the rules changed and the SCCA allowed them to de-stroke the factory engine so the 1970 Z/28 and Javlin and Mopar did not have to have a 305 limit on the factory built models. The SCCA had a bunch of Homologation rules and changed them as needed. Kurt, re the Camaro 302 powered Firebirds, I will relate what I have gathered from period reports and publications. The SCCA was very keen to get as many of the auto manufacturers participating in the T/A series. Their own rules stated no destroking of existing production engines was allowed, in order to meet the 5 litre engine size limit. As Pontiac had nothing close to the 5 litre size limit in a V8, the enterprising Canadian businessman, Terry Godsall proffered a Canadian Firebird. Canada has it's own auto industry, and the Pontiac cars were, in the case of some models, re-trimmed and rebadged Chevrolets. In other words, a Canadian Pontiac could be Chevrolet powered from the factory, and it would be very different from it's counterpart. The SCCA were perhaps a bit quick to accept that a Canadian Firebird could be had with a Z/28 302, but accept it they did. In 1968 Craig Fisher started campaigning a '68 Firebird with the 302, a Muncie transmission, but followed up by a Pontiac rear axle. 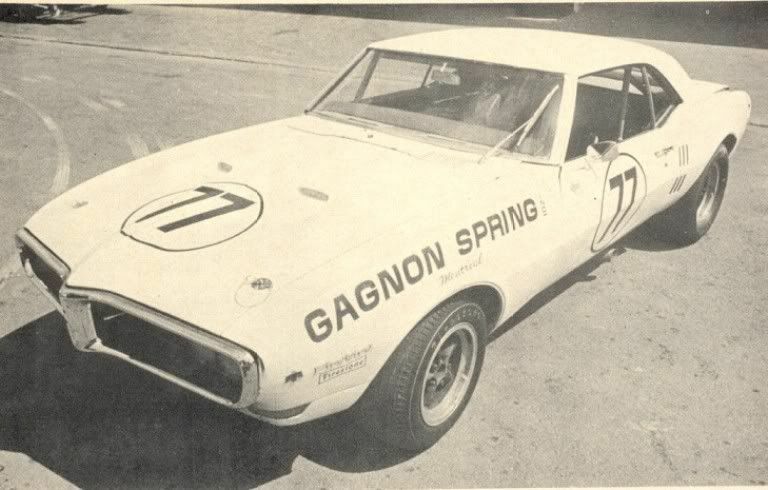 This became the first of a two car team financially backed by Terry Godsall, The second car, driven by Jerry Titus, was an actual Camaro, cosmetically altered to look like a 68 Firebird. This car was initially built by John Ward. Around this time Pontiac Division knew they had to build a 5 litre engine, and work began on a 303 cubic inch race engine, a version of which was slated to be available as a production option. According to SCCA regulations, there had to be 1000 production units made and sold, for any item to be homologated. The Pontiac engineers with help from Al Bartz built several versions of the 303, but it is a long slow road to the chequered flag for any race engine. The small block Chevrolet had by this time, had the benefit of over 15 years of development work, and it had been tinkered with by literally hundreds of engine builders and racers. The Pontiac team of Titus/Godsall were forced to keep using the 302, both from a lack of development point, and the fact that it still had not reached 1000 production units. But, the 303 did see some track time in the T/A series, though briefly, and without any significant success. It was 1972 before the 303 powered Pontiac took a chequered flag, Milt Minter gave the Firebird it's win at Mid Ohio. Here is a pic of my Titus/Godsall built '69 Firebird, it had a 303 in it at one point, and it did start life as a '68 Camaro. I'm aware of the Beaumonts and other Pontiac models with Chevy engines, but where I got confused is all Canadian Firebirds had Pontiac engines in them. So it sounds like a fib was told and the SCCA was happy enough to have Pontiac on board that they went with it. I didn't realize that Pontiac kept working on the 303 into the 70's. I thought they stopped in 69. I guess there was a little subterfuge in the Canadian 302 Firebird story, but it seemed to suit all concerned to some degree. The 303 was indeed doing pretty well into the 70's, and there was a 366 ci version in the NASCAR Grand American (Grand Am) series that ran without a restrictor plate. Buck Baker, H.B.Bailey, Tiny Lund and even Herb Adams piloted the Nascar versions. As Bruce said, in '68 they used the Chevy engine in the Firebird because of the Canadian loophole, but in '69 things took an even stranger turn. Even though Pontiac had worked up a 303 to fit within the rules, Titus used the '68 grille, hood and side gills on the '69 body to have a sort of hybrid that would allow him to keep using the Chevy in case the 303 did not work and/or was uncompetitive. It didn't work out initially and so he stuck with the Chevy engine and the mutated body style. For 1970, SCCA told them that they had enough of the phony baloney and they needed to run a Pontiac mill in the Pontiac body so that's what they did. They did not have a successful season and in fact Jerry Titus lost his life in a crash at Road America in the middle of the year. His team was working so many long hours trying to make the car competitive that it is believed a part in the steering was not tightened properly and Titus crashed straight into a bridge abutment (which led spectators to the inside of the track). I remember seeing the long skid marks on the track from his crash until 1974, after which we moved out to California. Pontiac engines have large main bearing diameters which made bearing speeds higher than other engines they had to compete against. I think this was a big problem for them but when SCCA allowed dry sump oiling for the 1971 season, that help Pontiac a lot. Roger Penske was the one who lobbied hard for the dry sump because the AMC engines he was running were also having oiling issues. Roger wisely claimed it was a safety issue, which it technically was if an engine blew and dumped oil in front of a pack of cars come up from behind. 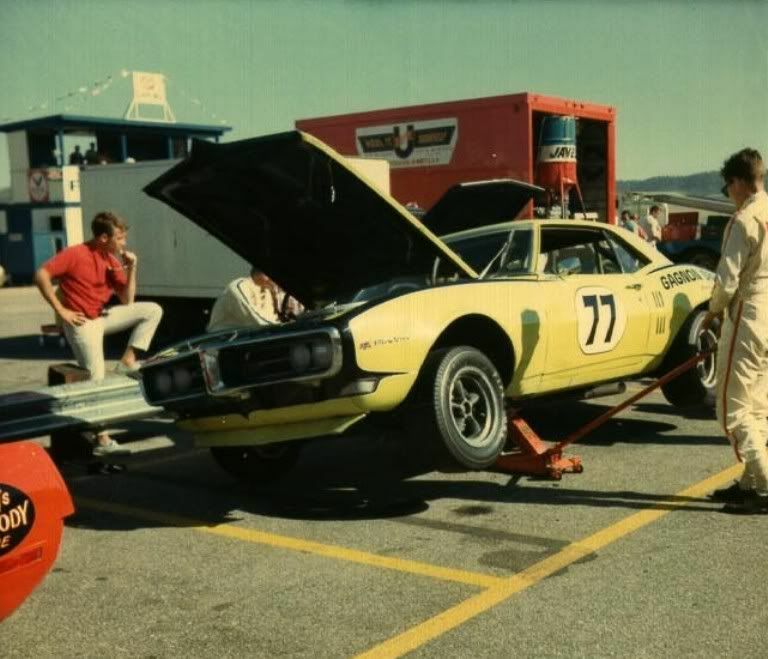 Here is a photo of Craig Fisher in his Titus/Godsall built '69 Firebird, that he ran for the first part (4 races) of the 1970 season. These cars were built to equal any of the factory race cars from Ford, Chevrolet or Mopar. They body shells were all seam welded, then acid dipped, and then the chrome moly roll cage was installed. All body to sub frame bushes were sold aluminum, the suspension bushes were aluminum with nylon inserts. The front upright was a lengthened custom forged piece that is what we now know as a dropped spindle. This made for zero camber change and thus bump steer and gave the Firebirds a theoretically front line handling capability. Brakes were GM race brake option code J-56, with the dual pin flanged brake pads, and thicker heat insulators. The rear end had a frame mounted watts linkage, again supposedly an advantage over the more conventional rear axle mounted system. Photo courtesy Roger Bolliger,and Henry Ford Museum. Here is a pic that shows one of the Titus tricks that made engine work a lot easier. The entire front end sheet metal complete with radiator and oil coolers lift off as a unit. Once the radiator hoses, and the oil lines are disconnected, two quick disconnect pins are released, and the whole front end can be lifted off. Not the best system for precise panel gaps, but this was not the show circuit, this was semi endurance racing were serious parts swapping was likely to be part of race day. This pic shows the car with 303 Pontiac engine, reasonably early in the season. The car still uses the American Racing 200 wheels, and the grill is the '69 Trans Am Firebird item that was synonymous with the 303 use. Very interesting photo with the removeable "doghouse" front. Are you aware of what other teams were doing this back then? Jon, I haven't seen any other team pics with that removable front, but I have seen a photo of a '69 Penske car that had a tube locator where the front radiator support to subframe bushes would normally be. With a lock pin through that locator, and maybe even the 4 bolts each side at the back of the fenders, it wouldn't be hard to do. Perhaps it was something that was used back at the garage more so than at the track. All the teams, and privateers, watched each other very closely. Looking for the latest trick or speed secret. i could say whether Pontiac were first to use this in the T/A series but I very much doubt taht they were the only ones. Thanks, Bruce. Now that you mention that about the '69 Penske Camaro, I do recall seeing that while at the vintage races. A check of the January '70 issue of Car Life magazine also discusses a quickly removeable front clip on the car. Photos of the '68 Craig Fisher Firebird taken around June or July 1968, before the flashier repaint to Godsall yellow/green. Great photos! Too bad not color. Well, the Firebird was white at that time so it's kinda like the photos are in color. more familiar paint scheme of this car. Craig Fisher jacking up the car.